Sugarpill Goldilux and Magpie Swatches and Turned into Nail Polish! 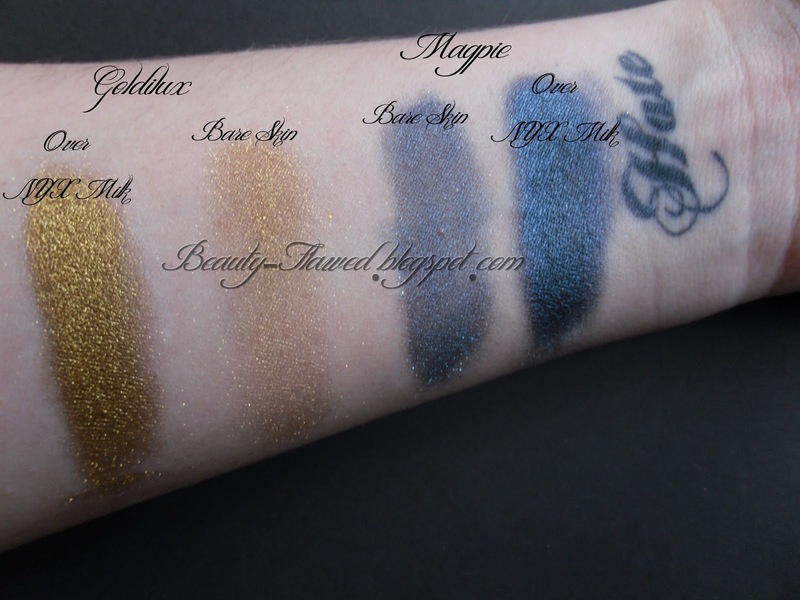 I'm sure you've seen them on many sites before the amazing Sugarpill pigments in Goldilux and Magpie, but you haven't seen mine. In case you haven't heard of them they are a Indie company that makes many vibrant and bold eye shadows that have awesome staying power. My boyfriend and my sister both ended up getting me the same ones but that is really good for me because I got to get a little more creative than I normally would. First I did a bunch of eye looks with these and they are amazing. They apply super smooth and have great pigmentation. I really think the swatches of these speak for themselves the color is great especially once you give it a little something to stick to. I've been playing with nail polish quite a bit lately and thought wouldn't it be great if I could turn these pigments into some really cute polish? So I did and on my first try I did some full color Magpie nails and they turned out pretty good but I'm a klutz and ending up denting and smudging them before I could get a good picture. All I did was put some pigment onto a piece of plastic that I could throw away and then poured clear polish into it mixed and applied it to my nails. I learned along the way that if you do this you must work very quickly otherwise the polish starts to get too gooey to work with. On my second time around I figured I do tips because it would make working with the polish quicker and easier for me to work with in the end. Here is a shot of the finished product which I'll be wearing just in time for New Years Eve tomorrow :) I'm no nail expert so this is the best I could pull off don't poke fun lol. I really like these colors and in the future I plan on picking up a few other colors from Sugarpill. The jars featured above are $12.00 each and you get 5 grams of product which IMO is very good for the price! 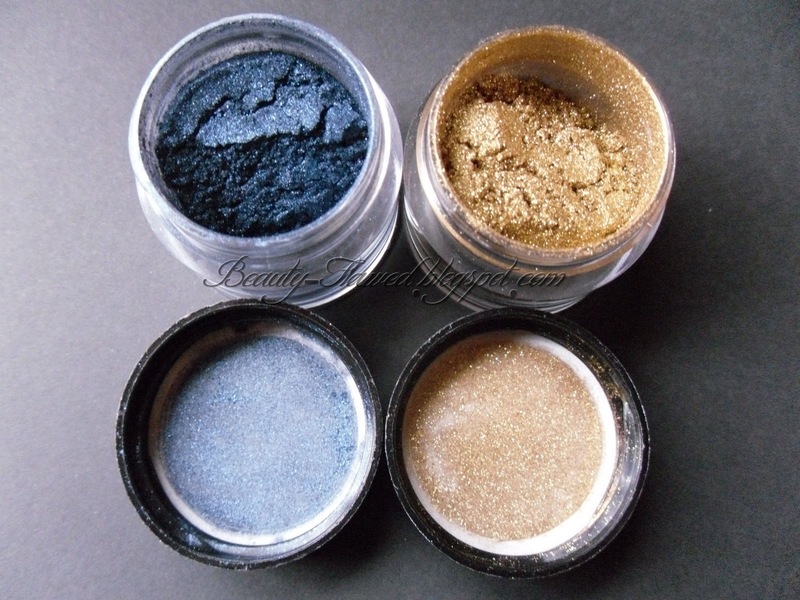 They also make vibrant pressed shadows and many more chormalust pigments! What do you guys think of turning them into polish? Do you have any Sugarpill products? Nice nails. I like the gold tips. ooohhh!!! I looooove Goldilux on the nails!!! Beautiful! OOO what a cool idea!